Table soccer / fuzz ball, table tennis/ping pong, billiards, portraits, jerseys, autographs, cocktails, great food and off course Beer. Well, I am talking about the South Bangalore’s Pride Underdoggs Sports Bar – A year old sports pub finally at Namma JP Nagar. It was in my wish list since it was launched and missed during their Initial Blogger Meets. However, a month ego, they again invited few bloggers to experience their Food, Games and Cocktails. Underdoggs Sports Bar and Grill has been the winner of Delhi, Gurgaon & Chandigarh’s best bar in the city numerous times. Winning the title at the Coca Cola Golden Spoon Awards, Indian Restaurant Congress Awards and the Times Food & Nightlife Awards to name a few! The ambience is quite terrifying and the soul of this lies in the sporty wall graphics, cricket helmet and skateboard lights, sporting memorabilia, the baseball mitt bill holders and multitude of TV’s and gaming options. The place gives one a sensation of being right there amid the sports representations. Underdoggs Bengaluru is the dwelling to Watch Sport. Play games. Eat. Drink. And Party! Watching sport is a joy with 30 large fully HD TVs and projection screens positioned at clever angles for wide-ranging viewing pleasure. There is a collection of attractive drinks lined up. You can sip, swill or gulp their Watermelon Smash spiked with gin, and topsy-turvy with fresh mint and watermelon, experience the thrill of a outstanding spicy and sweet blend with their Pineapple Jalapeño Margarita, discover their Smoked Rosemary & Whiskey cocktail or knock back their fan favorite Flaming Hot Cinnamon Whiskey Shots. Another innovation are their sporty Beer tubes (2.64ltrs), which make makes drinking a team act, and looks super cool on the table. A preset menu was designed for the Meet and which include Makhani Pizza, Garlic Lover’s Pizza, Naan Rolls, Tandoori Dim Sums, Rum Gulab Jamun with ice cream. When it comes to Cocktails, there were Cinnamon Whiskey (Shots), Gayle’s Rum Runner, Robbin Van Berry, Xavi Basil Pina, Mary Kom Cooler, Litchi Kamakazi. I totally adored their Naan Rolls, which is something innovative and will not find these in any of the restaurants in the town. The Naan was super soft and it was topped with Paneer Sabzi. The curry was flavorful, spicy and appealing. It goes perfectly with the Cocktails and Beer. Whereas, Tandoori Dim sums were outstanding with Indian Chinese stuffing and presented well! Pizzas were also not disappointed, though a Desi Toppings. I have also tried their Cinnamon Whisky shots & Gayle’s rum runner, which are perfectly done without any complaints. A meal doesn’t end without a Dessert! Another innovative dish, that’s Rum Gulab Jamoon with Ice Cream – It looks like a regular Jamoon. However, the Rum flavor & frisson just bursts after a bite. It was made with perfection! It was an unforgettable meet with fellow bloggers! 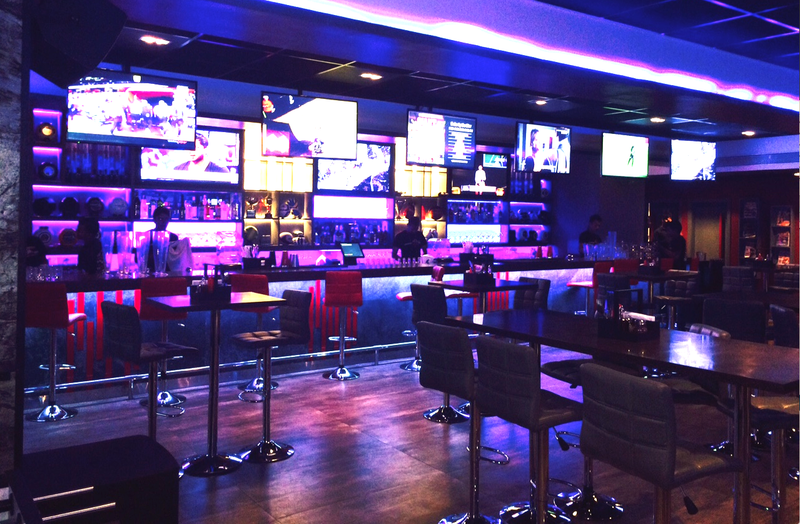 It’s time for you to gulp some pioneering cocktails & fusion food at Underdoggs Sports Bar! I love the Delhi Underdoggs! Your pictures are absolutely fabulous… make me want to drop by Underdoggs on the weekend, lol.